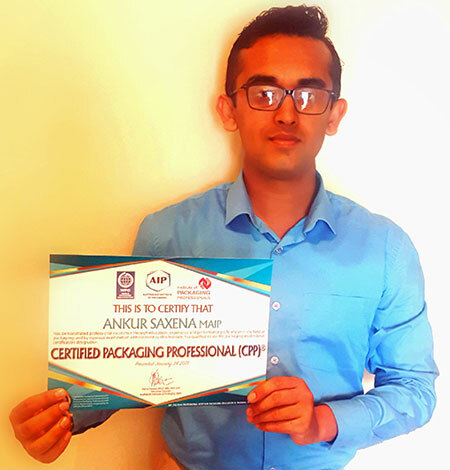 The Australian Institute of Packaging (AIP) would like to congratulate Ankur Saxena MAIP for attaining his Certified Packaging Professional (CPP) designation. Offered exclusively through the Australian Institute of Packaging (AIP) in Australasia, the Certified Packaging Professional (CPP) designation is the leading mark of excellence internationally and a must-have recognition of industry proficiency and achievement for packaging professionals. Q1:How long have you been in the industry? What are your areas of expertise? A: I have been in the Packaging Industry for more than 6 years. My areas of expertise include plastic components – bottles and jars, metal tins and cans, aerosol, paper and paperboard manufacturing corrugate and printing processes which includes offset, flexography, gravure, screen and digital printing. I also possess a thorough understanding of Factory Operations such as Filling & Packing Lines, Engineering Design, Labelling, Production Design Layouts with Manpower Utilisation, Conducting Risk Assessment, Specifications Development, Process Capability (Statistical Process Control and Control Charts) and Process Improvements, Lean Six Sigma Green Belt, HACCP, Packaging Safety and Compliance. I have also developed commercial acumen related to Packaging Procurement, Total Delivered Cost, Conversion Cost, Cost Optimisation. From an IT-systems point of view, I also hold a good amount of exposure with SAP-MM, Bill of Materials (BOMs), Oracle, AutoCAD and Microsoft Office. Q2: What made you apply for the Certified Packaging Professional designation? A: I always believed that there should be an industry-specific benchmark qualification achieved in Packaging Industry, which will help me develop my career in the organisation I am working with. So, when I came across Certified Packaging Professional designation, I made my mind to study and sit the exam. Q3: How important is attaining the CPP designation to you as an individual? A: With CPP designation, and using the concepts mentioned in 5th edition of Fundamentals of Packaging Technology I can contribute to the Packaging development process of my organisation, making it much more standardised and cost-effective. Also, having my CPP designation will help me with validations of my skills within the global community of Packaging Professionals. Q4: How important is the CPP designation for the greater recognition of packaging professionals? A: CPP designation is a global recognition that will help Packaging professionals to be recognised for their skills and to be highly- considered for Packaging roles. Seeing the CPP designation should greatly assist companies to hired based on packaging work experience, technical know-how and skill-sets. Isn’t it time that you joined recognised packaging experts from around the world with the industry’s leading professional designation? Attaining the CPP® designation is an excellent investment in your professional development and the credential defines the packaging professional and allows organisations to seek out and hire the right professional based on verified knowledge, skills and industry contributions. CPP is a designation some of the leading packaging companies in the world want their influential team members to have because it demonstrates broad competency in all major areas of packaging. CPPs today typically enjoy more senior, decision-making positions in their companies, and research also suggests that holders of CPP often out-earn their non-certified peers. CPP credential demonstrates that a packaging practitioner possesses packaging knowledge, experience and skills to the degree that they deserve recognition as a true packaging professional; a cut above their peers.